A fundamental purpose of education is to learn how to write. As students pass their exams and graduate to the next class, writing essays, assignments and preparing notes become more difficult. Students are given tasks to summarise, describe, analyse and critically evaluate on various subjects, and all the while they are expected to increase their vocabulary and perfect their writing skills. Simply put, if you are educated, you should know how to write. Unfortunately, often times, the proverbial spoon feeding turns out to be the easiest and quickest option or solution for our students and teachers in Nagaland – a weakness we need to address, but we’ll keep that discussion for another time. All through the failures and successes the world has witnessed, its citizens are becoming increasingly vocal. Voicing opinions and thoughts is the only way of being heard. While having the gift of gab is just as swell, another effective way of doing this is through writing, a form that will always be available for posterity. We believe that there is a greater urgency for proficient writers in Nagaland – Writers who can voice their opinions with clarity and coherent thought. As opinions are being voiced in newspapers, blogs, online groups and more, the urgency of writing well prevails stronger than ever before. We need to harness the potential of young budding minds and what better way can we do that than by not only teaching them but also providing them a platform to display their skills and opinions, while they are young and willing. Featured in this week’s Degree of Thought is an essay by student P. Jonglio, who is the winner of the Tetso College Essay Competition (Degree Level) held in 2012. Mass media is a means of communication that reaches a large number of people with a common message. It has firmly entrenched its roots in our life and now it is hard to survive without it in the modern age. It is often said that the world has become a global village. It is the media that has shrunk the world into the village. Telecommunication, television, radio and computers have reduced distances and brought countries of the world closer to each other. We live in a fascinating world and even more fascinating society. 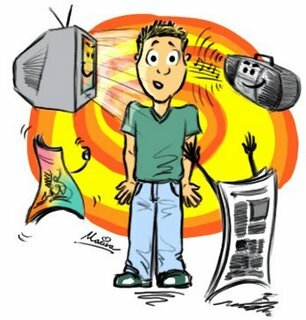 We are part of a culture where every morning we wake up to the energized voice of the morning news filling us in on the beautiful sunny weather outside, and at the end of the day, exhausted and hungry, we crawl home, where our T.V., radio or computer are waiting patiently to be at service. In this world, life without technology feels utterly impossible and life without media is simply unimaginable. When information is communicated to a mass audience by different means, we term it as ‘mass media’ of communication. Mass media includes both electronic and print media. The electronic media includes radio, cinema, television, films, e-resources etc. while print media includes newspapers, books, journals and magazines. Media in today’s world, like every coin has two sides, both positive and negative implications. As far as society is concerned, one thing that should be kept in mind is that, it depends upon the society to reap the positive and negative outcome from media. Media helps us to evaluate important burning issues and spreads awareness of current events. The society we live in is saturated with media. The effect that the media has on society also affects education in a very big way. The impact of mass media on the society can be cited in the following ways. Media has helped in the diffusion of education to the masses by spreading ideas, establishing common interests that help to spread enlightened culture. Media plays a significant role in moulding public opinion. It increases social awareness, encourages active participation of the individual to realise his duties and obligations, raises his standard of thinking and behaviour. Mass media is a powerful means of public education. It has helped in eradicating illiteracy, increasing mass awareness on various social issues, equalizing educational opportunities, promoting a secular and egalitarian society. Mass media has improved not only the quality of education but also caters to a larger section of the population. Thus, its contribution is both qualitative as well as quantitative. Mass media contributes to the constructive use of our leisure time, which would otherwise have been wasted. It helps develop new found interest and appreciation on a wide variety of subjects, and also fosters creative ability. Mass media broadens the outlook of people with regard to religion and culture, as it enlightens listeners on information, helping to remove superstitions, taboos and prejudices. Thus, media is becoming increasingly important in the life of adults as well as of children. We acquire a great deal of information from the different forms of media such as newspapers, films and documentaries, journals, radio, motion-pictures and more. Media covers a plethora of information that is accessible to all the different corners of the world. Thus today no one can be indifferent to the question of mass media and its effect. We need to handle the mass media wisely because depending upon the way the mass media is used, they can be tools not only for personal enrichment, but also national and international advancement and cohesion. okay thank you /……the ideas were very helpful for my school debate. Thank you for sharing this essay. I wondered if I could use some of your information and the picture at the top for a MIND OVER MEDIA Powerpoint Project I am working on. I would be happy to send some of the info over when I am complete. I appreciate your research. We would also like to see some info when you are complete with your research. Mass media is indeed a very important part of the society. try our link. this might give you some interesting information. Can I get some information? Are you looking specialist in mass communication assignment help? Don't worry Needassignmenthelp to assist you in mass communication topics. Smart Business of India we are providing Digital Marketing and mass media specialist master’s program will transform you into a complete digital marketer and with expertise in the top courses digital marketing domains — search engine optimization, social media, pay-per-click, conversion optimization, digital analytics, content, affiliate marketing, influencer, mobile and email marketing. Fast-track your career in digital marketing, all type of mass media courses today with practical training you and also provide 100% Job in our organization Nationnews9 and Shivjimeida Tech Pvt Ltd.